South Australian artists, craftspeople and designers are being given the opportunity to catapult their careers to the next level through a new mentorship program offered by Guildhouse. Funded by philanthropic organisation The Ian Potter Foundation, the program will offer 23 mentorships, each of six to eight months’ duration, over the next three years. They include 20 mentorships worth $5000 and three $10,000 mentorship opportunities for more established artists. Guildhouse CEO Emma Fey says the program, named Catapult, addresses a challenge faced by many independent creative professionals. “As independent artists and microbusinesses, there is no formal organisational structure to support professional development. It builds on an earlier pilot mentorship project, Limber Up, whose participants included installation artist Sasha Grbich, whose work Sit Down With … is currently being exhibited at the new MOD (Museum of Discovery) on North Terrace. She was mentored by sound artist Christopher Williams, developing her understanding of processes such as sound editing. Another participant, contemporary jeweller Lauren Simeoni, says her six-month mentorship by printmaker Simone Tippett enabled her to take her practice in a new direction. “It was one-on-one mentoring, so I could learn some specific things from her [at Simeoni’s studio at Gate 8 Workshop collective] without doing a whole printmaking course,” she says. 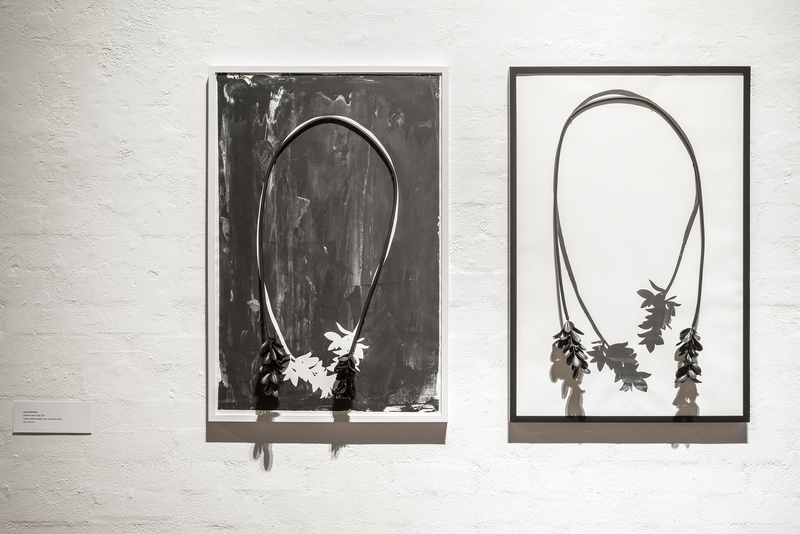 Lauren Simeoni’s Shadow Lines l + ll, were exhibited last year in ’The Rubies’, an alumni exhibition at Canberra School of Art. Tippett also helped Simeoni develop ways of handprinting designs on dresses to be worn with her jewellery. The resulting one-off pieces featured in a solo exhibition, Lei Over, which she presented last October in Shanghai, China. “This new direction really wouldn’t have happened without the skills and conceptual development time the mentorship gave me,” Simeoni says. She says the pair also share a similar sense of humour, and presented a fun collaborative exhibition at the Wheatsheaf Hotel, highlighting SA icons. Guildhouse says the new Catapult project, for which applications will be sought from late July, will have a strong focus on regional artists as both mentees and mentors. It also includes a research study, in partnership with the University of South Australia, to examine the impact of mentorships on artistic careers over time.